My love of gardening properly kicked off in my late 20s, when I entered the Stockbridge Colonies garden competition and won "Most Improved Garden" - I was delighted. I had never won anything before and for the first time I realised I had a hobby that I was actually quite good at. The arrival of three little dragons in quick succession (three under three!) meant that I could no longer do anything ON MY OWN; sadly, that included my new love of gardening too. I began to really miss the head space gardening gave me, I realised my moods started to suffer and anxiety was setting in. For me, being outside not only clears my mind but it centres me. Becoming a mother massively changed my life in every respect - I had gone from wearing beautiful Austin Reed silk suits, (three piece Thursdays, champagne Fridays) and working my way up the corporate ladder as chief breadwinner, to a leisurewear- clad dependant spattered in a variety of children’s bodily fluids. I felt totally alien in this brave new world. I just had to get outside again; I needed to keep my mind healthy. I prayed that I had bred green fingered offspring! So, after a move to the coast and a big house renovation, I set about redesigning our new garden, with great intentions of getting the kids involved. One of my kids’ favourite (and easy) things to attempt in the garden is to grow runner beans up supporting canes to create a secret edible Teepee. The best time to do this is NOW (end April, May once the risk of frost has passed). Decide on a sunny spot to best place your wigwam. It will be here all Summer so make sure you are happy with its positioning! You now need to fill your pots with soil. Place them in a circle, making sure you leave an entrance for your little people to be able to get in and out! Use a ready made seed mix (I like to make my own with a third seed mix + a third perlight + a third sand) and fill all the pots up to approx an inch below the top. Now get your bamboo canes (get the tallest ones you can, ideally 1.5 - 2.5 meters) and make a teepee structure by pushing two canes into one pot. Make sure you push the canes down firmly and then firm the soil around so they are secure and can stand on their own with no support from you. Use some garden twine to bind the top of the bamboo canes together a la Monty Don. Now you need to wind the twine around the canes so that the beans have something to hold on to when they start growing. Wrap the twine around the cane and around again then wrap the twine around the next cane,and again and then wrap the next cane and so on. Remember to leave an entrance! Make sure the twine is strong and the canes are secure in the soil and create a layer of twine every 10-15 cms. You will need more at the bottom than the top as the new plants will need extra help to support and train them at the bottom than at the top. Once your structure is complete, give all your pots a good water soak. Now the fun bit, the planting. I recommend using the red flowering runner beans "Scarlet Emperor" or "Polestar" (for shits and giggles) which you can pick up in all good garden shops for a couple of pounds. Push them into the wet soil so they are covered by about an inch of soil. The aphids will love your wigwam almost as much as your kids so to prevent losing your crop of crunchy beans to these green meanies, you need to plant a sacrificial crop. Sounds awful but trust me, it's worth it! Nasturtiums are perfect as they act as a combination plant for many crops, not just runner beans. They grow ridiculously quickly, have wonderfully cheery colours and repeat and repeat so when they start to look tatty, just cut them back and watch them regrow (you can also save the seeds so you can do this next year). You can also eat the flowers and the leaves, they are quite punchy but worth a try, almost radish like. Plant 5 seeds, just as you did with the beans, at the front of the pots. These lovely flowers will cascade down over the pot and look splendid. Now all you need to do is keep your pots watered regularly at least until they have started to establish themselves. Try and water every second day. Don't drench but do give them a good soak. The seeds will begin to germinate within 7-14 days and will start to sprout through the soil. 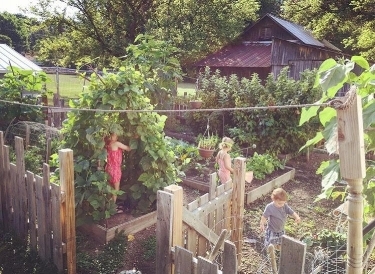 Once they get tall enough to hook onto the first level of twine, give them a helping hand by tying them to string and/or the canes so that eventually the bean plants will start to wrap themselves up the teepee. When tying a plant in make sure you don't cut off the water and oxygen supply to the plant by tying them too tightly. Too avoid this, wrap the twine around the cane first and then wrap the same bit of twine around the stem, loosely and then tie a bow. For the next few months make sure you go out and check your wigwam regularly to keep it watered and tied in. The nasturtiums tend to look after themselves but do cut back any fading blooms. Get the kids to start harvesting the long beans when they are about 6-8 inches long. The more you pick the more will grow so be prepared to pick daily and really do make sure you check the whole plant as they practically grow overnight! You should get 6-8 weeks worth of cropping for this wigwam. These beans are best boiled or steamed. They make a super green side dish and growing and eating these will help teach your kids where food comes from and the importance of growing your own and will show them how fun and easy it can be. Not only do the kids have a secret den they can escape to, you can also look forward to a bit of peace! Once it's finished flowering, remove all plants to the composter or your brown bin. Now it's time to try something else! How about reusing the soil in the pots and growing your own garlic? ..... until next time…..
P.S. I loved writing this and sharing my tips, I really hope you enjoyed reading this too. Any feedback (positive or negative) is appreciated and if you have any gardening dilemmas, questions or topics you would like me to discuss, shout!